If you suffer from acne, you want something to calm and soothe your skin, don’t you? Fortunately, help is at hand with Dermalex’s Acne Treatment. It aims to reduce major acne symptoms in just four weeks. Acne is a common skin condition that affects approximately 80% of the population. Although acne is usually thought of as a problem for teenagers, adult acne is on the rise with over 1.3 million adults in the UK suffering from it. Often caused by inflamed skin or excess oil production in the sebaceous glands at the bottom of hair follicles in the skin, acne is a mixture of blackheads, whiteheads or papules (small raised bumps). Symptoms can vary depending on the individual but typical symptoms include red spots on the face, back and neck. Acne symptoms can be managed and treated with a gentle and regular skin care regime, a change in diet, drinking more water as well as increasing exercise to lower stress levels. Traditionally, certain oral antibiotics or creams (with harsh ingredients such as benzoyl peroxide) can also be prescribed by a GP. 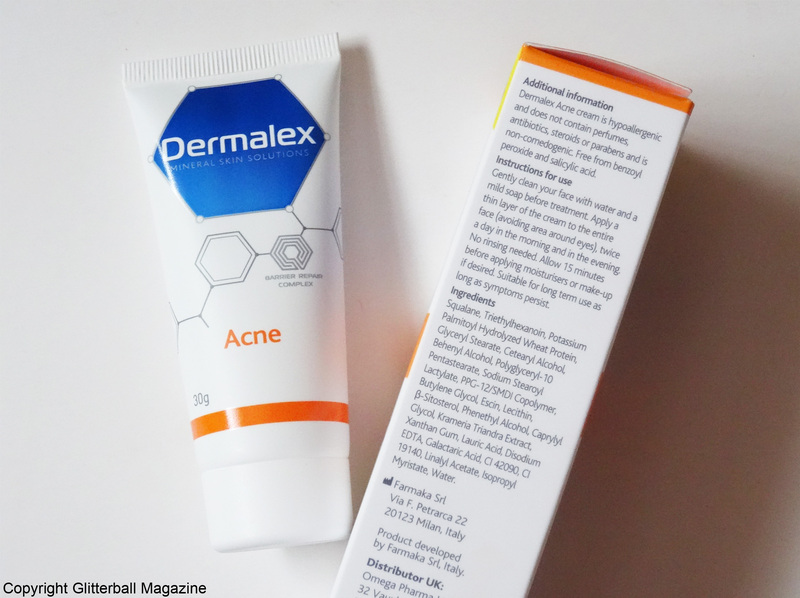 Acne Treatment by specialist skin care brand Dermalex tackles mild to moderate acne symptoms including acne spots, redness and swelling without drying out skin. It’s made without antibiotics so you don’t have to worry about your skin when you use it. The lightweight cream hydrates and protects skin. It’s non-greasy too. It includes their breakthrough formula, MEC4 complex, which targets the root causes of acne by creating an unfavourable environment for acne bacteria growth. The cream has been tested in a clinical trial and there was an overall improvement in 76% of patients after just four weeks’ use. Impressive. It’s so simple to use. First, clean your face with a gentle cleanser (I highly recommend DHC’s Cleansing Oil followed by Bioderma’s Sensibio Micellar Solution). 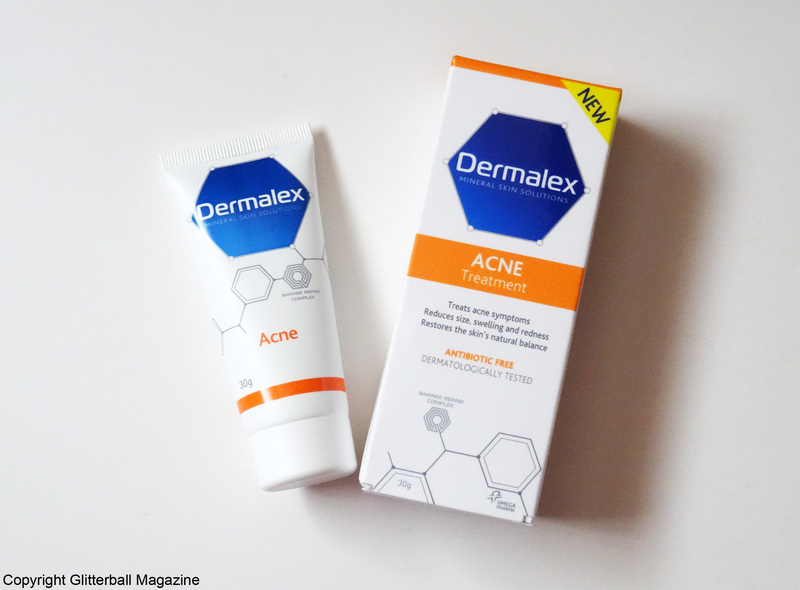 Make sure your skin is dry before you apply Dermalex Acne in a thin layer over your face (avoiding your eye area). If you’re putting a moisturiser on afterwards or make up, you’ll need to wait 15 minutes for it to be absorbed into your skin. After that you’re good to go! The formula is gentle enough to use twice a day and because it’s steroid-free it can be used for as long as you suffer from acne symptoms. I’ve had acne for about 4 years now, it can get from mild to quite severe, i have whiteheads blackheads spots and occasional cysts, sometimes up to 4/5 which can be extremely painful usually I get 2/3 spots a day. I’ve tried antibiotics and other prescriptions too but nothing works as well as this, and it has no harsh chemicals or antibiotics in it! bonus!